Anand Teltumbde is a civil rights activist and a columnist with the Economic & Political Weekly. 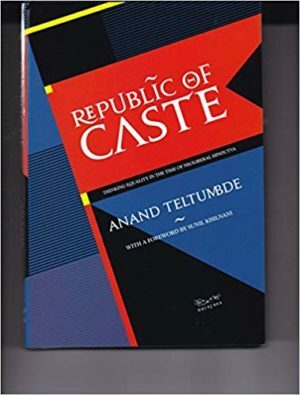 Among his many books previous to Republic of Caste: Thinking Equality in the Time of Neoliberal Hindutva include Dalits: Past, Present and Future, Mahad: The Making of the First Dalit Revolt and The Persistence of Caste: The Khairlanji Murders and India’s Hidden Apartheid. He teaches at the Goa Institute of Management. Categories: Navayana, Politics, Social Sciences, Sociology and Anthropology. Tags: 9788189059842, Caste in India, Caste System, equality, Hindutva, Navayana. Revolution, the OBC upsurge, the rise of regional parties, and up to the nexus of neoliberalism and hindutva in the present day. Joining the dots between a wide range of events on the ground and the prevailing structure of power, he debunks the pieties of state and Constitution, political parties and identitarian rhetoric, to reveal the pernicious energies they have unleashed and their dire impact on India’s most marginalised people, the dalits. way out of the present impasse.